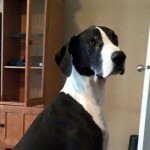 Meet She-Ra - Rocky Mountain Great Dane Rescue, Inc.
Hi, I’m She-Ra! I’m a 7 year old mantle female Dane with natural ears. My parents are going their separate ways, so I’m looking for a new place to call home. I’m good with other dogs, though I’ve never lived with one. I’m good with cats too and have lived with one. I’m also good with kids. I know all of my basic commands and am housebroken. I’ve never spent any time in a crate, but I am trustworthy with free roam. I also do well on a leash with a strong leader. I think that about sums up the big things, but we should really get together to see if we could be the best family!